Pretty much everyone wants a flawless smile with teeth that look healthy, straight, and white. With the many advancements in cosmetic dentistry over the years, our patients are able to achieve their dream smile through a variety of treatment options. Two of the most popular solutions that our team offers to help enhance patients’ smiles are teeth whitening and porcelain veneers. 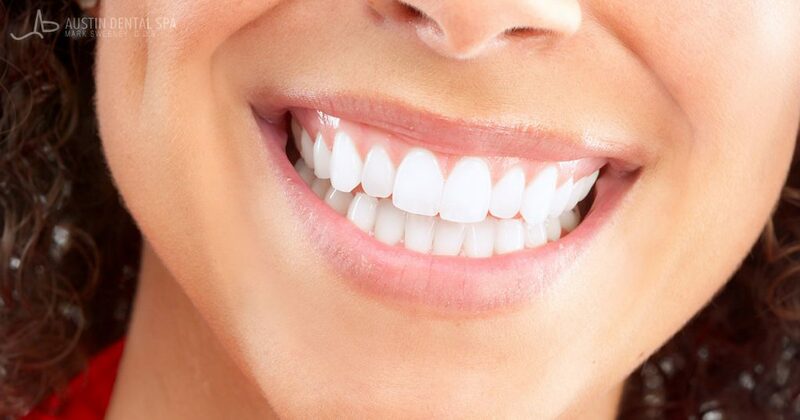 Although both treatments can be used to transform a patient’s smile, teeth whitening and porcelain veneers have unique benefits. Professional teeth whitening at Austin Dental Spa can brighten teeth as much as 8-15 shades or more. Even dark stains, like tetracycline-affected teeth, can be improved with our advanced whitening systems. Porcelain veneers are used to conceal a variety of tooth imperfections, including chips, cracks, gaps, and stains. The process usually requires some degree of tooth preparation before the custom-made, ultra-thin porcelain shell is affixed to the front of each tooth. Since teeth whitening is considered a more conservative treatment, Dr. Sweeney will typically recommend this option first for those wanting a brighter smile. Patients who have additional concerns, such as wanting to address tooth cracks or mild misalignment, may be better suited for the porcelain veneer treatment. The best option for your needs will ultimately be determined during an oral evaluation with Dr. Sweeney. To get started on your journey to a bright and beautiful smile, please contact our office today! This is a question we get from many of our patients interested in teeth whitening. The truth is, if your treatment is done correctly with properly fitting whitening trays, you should not have to worry about any damage or problems with your gums. However, it is not uncommon for people to experience irritation if they use trays that are not custom-fitted to their teeth. Fortunately, any problems that may occur are typically minor and fade within a day. Since our in-office treatments at Austin Dental Spa use stronger whitening systems, our dentists also shield the gums before the whitening process begins. By doing this, you can avoid getting a chemical burn from the bleaching agent sitting on your gums for too long. These burns cause the gum tissue to appear white, and although uncomfortable, bleach-induced burns typically heal within a short period of time. If you are given take-home trays to use, your dentist will confirm they fit properly to avoid any problems as you whiten your teeth on your own time. We will instruct you on how to use the at-home trays to help you protect your gums from any irritation. When you come in for your appointment, we encourage you to ask any questions you may have so our team can help you feel comfortable with the process and know what to expect. Teeth whitening is a temporary treatment for stained or discolored teeth. Although effective for many individuals, the results of your teeth whitening will gradually fade with time. Just as the whitening process varies for every person, so will the longevity of your results. Patients can typically expect their bright smile to last anywhere from six months to two years before fading, at which point they may wish to return for another treatment. However, those who habitually expose their teeth to staining foods and drinks – like red wine, coffee, and tea – as well as people who smoke may see their results begin to fade as soon as one month. Overall, the length of time you can expect your whitening results to last will vary according to the condition of your teeth, severity of staining, and method used for whitening. To help prolong your results, our dentists, Dr. Mark Sweeney and Dr. Jordan Slagter, recommend limiting high staining products as well as avoiding smoking. Touch-up treatments will be necessary to maintain your optimal results long-term. 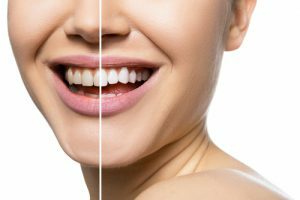 Teeth Whitening Vs. Porcelain Veneers: Which Is Right for Me? With so many cosmetic dentistry treatments available, it can be difficult to determine which solution is best for you. 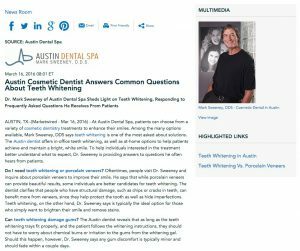 Among the many options that can enhance your smile, patients at Austin Dental Spa often inquire about teeth whitening and porcelain veneers. Both solutions can provide a whiter smile, but when is one better than the other? Teeth whitening is a minimally invasive option that utilizes a bleaching agent to target stains and discoloration. Our team offers both KöR Whitening Deep Bleaching™ and Zoom!® Advanced Power™ as highly effective whitening systems. Although teeth whitening is not a permanent solution, it is often a great solution for many people wishing to brighten their smile. Those who do not make good candidates are typically those with poor oral hygiene or with gum disease or tooth decay, in which cases the decay must be treated first. Additionally, if you have deep tooth staining, teeth whitening may not provide you with optimal results. Porcelain veneers are tooth-colored shells that are placed over the affected teeth to correct a variety of cosmetic imperfections. Since veneers permanently alter the tooth, they are typically not recommended unless a patient has structural damage (such as chips, cracks, and worn enamel) or severe staining problems. Like teeth whitening, porcelain veneers are not ideal for those with tooth decay or gum disease, as these issues must be corrected prior to cosmetic treatment. When you come in for your appointment with either Dr. Mark Sweeney or Dr. Jordan Slagter, you will have the chance to ask questions and express any concerns that you may have. Upon assessing the state of your teeth, our doctors will recommend the most conservative form of treatment that can provide you with your goal results.